The Facebook Ad analytics are very revealing. By far and away, most people are viewing the website on the mobile phones and I know that that does not come as a shock to anyone. This website now is all about employing Facebook Advertising to get the word out about key aspects of Kristin's case. Primarily - the unfinished work regarding digging up Susan Flores yard, but also reminding people about the Deposition back in 1997. Paul Flores took the 5th 27 times. Tim Davis refused to attend. So - this is the behavior of the two men who walked Kristin home from the party the night she vanished. The Latest News/Shop on Amazon/Analytics/Facebook Ads/ Help Kristin and 5,000 ads 'Information Blocks' are designed to be eye-catching in a crisp and clear format. They work very well on mobile phones. I will put all the latest news in the first 'Block' as people are always interested in getting the latest info. I received a phone call from Mrs. Smart this week. She was calling me because a retired FBI Agent was upset because he was contacted by the Law Enforcement (I assume the SLO Sheriff's Department by way of the Tiburon Police Department) who were upset because they were contacted by Tim Davis. Tim Davis seems to be upset because 'Dennis Mahon' is harassing him. There is so much that is 'wrong' with this chain of miserable events that I decided to share it with you publicly. 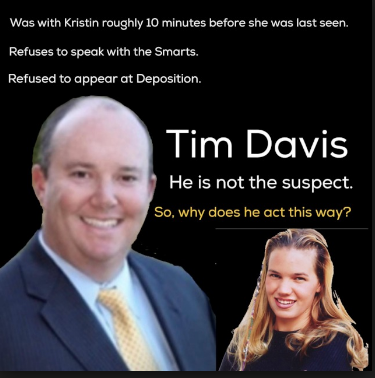 Many people don't know this, but the only reason I even got involved with Kristin is because way back in 1997, the San Luis Obispo Sheriff's Department were no longer even bothering to return Mrs. Smart's phone calls. When Denise Smart told me that, I just said, 'I'll help you". Tim Davis was the other guy walking Kristin home with Paul Flores that night. Davis refuses to speak with the Smarts. Ever. Davis never even bothered to attend the deposition in 1997. Heck, at least Cheryl Anderson showed up. I did not contact Tim Davis recently. Nor did I advise anyone to do so. When I did contact Davis, it was several months ago. I never hid. I even made a podcast about it. For the record, I congratulate anyone who 'contacts' Davis. Kristin deserves that kind of respect.